And so, we venture to the most breathtaking sights, threatened by a changing, warming planet, chilling beauty on the verge of vanishing. The depths of a remote ocean paradise. Belize's great Blue Hole, a reef in peril. Down under, the Australian continent dangerously dry. The frigid north, Iceland's vast glaciers melting. And up Africa's highest summit, where the snows of Kilimanjaro are disappearing. The warnings are stark. A vortex of trash twice the size of Texas, toxins bleeding into the ocean, rivers that can not reach the sea, species lost forever. Clouds, rain, storm's fury borne of the ocean, slowly drown distant nations. Islands disappearing and in their wake, a new kind of refugee, so far away and so close to home. Throughout our planet and within our bodies, water flows. We cannot survive without it. Yet, 1 billion people don't have enough. Our new thirst may fuel wars. Is water the oil of tomorrow? ANN CURRY: We're coming to you now from the first, we're told, is the first live network broadcast from Mt. Kilimanjaro, it's the world's largest standing, free standing mountain. It's at more than 19,000 feet. Mt. Kilimanjaro's majestic, snow capped peaks are increasingly becoming a symbol of climate change. Scientists predict the glaciers could completely disappear by the year 2020. So we've been climbing this mountain since Friday. Our goal is to take you to go up there and see with us the glaciers. We've chosen the hardest route because it will take us closest to the glaciers. We'll have a report on this effort to get there, to get closest up there and also on this issue of climate change and what the melting of these glaciers mean. AL ROKER: Iceland is the worldwide leader in clean energy. Iceland does face a big problem though. The glaciers are melting and that's causing a problem. By the end of the century the glaciers could be all gone. But in the meantime we're gonna be examining that and taking a look at how this country is a leader in hydro-electric power and it could be an example for the rest of the world. We'll have more on that a little bit later. 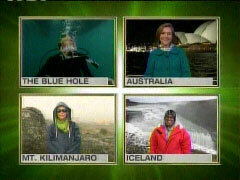 MEREDITH VIEIRA: This is year two of our "Ends of the Earth" series, at least, we hope it will be a yearly series. Last year, we focused, big picture, climate change. This year we decided to focus on the one resource that we cannot live without, the building block of life, water. To the ends of the Earth and into the blue. It's our first fuel and most essential. Mesmerizing, precious, powerful water. It covers 70 percent of the planet, provides half of our oxygen, and yet, we've only reached about 5 percent of the sea floor. In these oceans barely explored, creatures unknown hold the key to life on Earth and life beyond. Yet, we know more about the surface of distant planets than we do about our own. And so, we venture to the most breathtaking sights, threatened by a changing, warming planet, chilling beauty on the verge of vanishing. The depths of a remote ocean paradise. Belize's great Blue Hole, a reef in peril. Down under, the Australian continent dangerously dry. The frigid north, Iceland's vast glaciers melting. And up Africa's highest summit, where the snows of Kilimanjaro are disappearing. The warnings are stark. A vortex of trash twice the size of Texas, toxins bleeding into the ocean, rivers that can not reach the sea, species lost forever. Clouds, rain, storm's fury borne of the ocean, slowly drown distant nations. Islands disappearing and in their wake, a new kind of refugee, so far away and so close to home. Throughout our planet and within our bodies, water flows. We cannot survive without it. Yet, 1 billion people don't have enough. Our new thirst may fuel wars. Is water the oil of tomorrow? But there is hope. What man has undone nature can replenish, if we allow it. At the ends of the Earth, "Today" takes you live to destinations profoundly majestic and desperately fragile. Sounding a call to save our precious waters as we dive deep into the blue. And now let's head about 7,400 miles away from here to Ann Curry on Mt. Kilimanjaro. Ann? ANN CURRY: Hey, Meredith, good morning. You know, Mt. Kilimanjaro's comprised not of one, but actually three volcanoes. Its name said to mean, "Mountain of Greatness, but it's becoming known locally as the "Mountain of Defeat." At 19,340 feet, Mt. Kilimanjaro is the roof of Africa, described by Ernest Hemingway as "as wide as all the world." Great, high, and unbelievably white in the sun. But the snows of Kilimanjaro are vanishing. 84 percent of her glaciers have disappeared in less than 100 years. To get a close look at this change, our NBC News team is taking the hard route up this mountain, as it will get us nearest to the glaciers. Dramatic NASA images reveal how fast Kilimanjaro's ice has retreated in just seven years. Climate change is the lead suspect, as ice is vanishing on mountain glaciers all over the world. Glaciologist Lonnie Thompson says this represents the permanent loss of ancient evidence that could tell us about future climate change, and it could all be gone as early as 2020. LONNIE THOMPSON: Certainly, the glaciers on the summit are dying. I think their sentence has already been passed. We're just waiting for it to be carried out. CURRY: This run-off from Mt. Kilimanjaro's melting glaciers has come down through here for thousands of years, may within a lifetime, be completely gone. That, and Kilimanjaro's shrinking rainforests, due to deforestation, are already threatening water supplies for the tribes people living below, including the Masai. They say their mountain is dying. So, tomorrow we're going to be showing you exactly how people living below this mountain are being affected by the diminishing water, and we're also gonna, a little bit later this morning show you what it's been like to take this big climb so far up this great mountain. MATT LAUER: And we've been talking, throughout the weekend Fabien, about the person who doesn't think when they throw a plastic bag into a river, or a plastic cup or a plastic water bottle, even though this seems like a pristine environment, we've seen those things washing up on shore around here. FABIEN COUSTEAU, JACQUES COUSTEAU'S SON: We are in some of the most pristine areas here in this area, and I've seen debris floating around, plastic bags and cups and everything else. That washes out from way up in the mountains. You don't have to be on the oceanside to affect the oceans, and in turn, the cycle will come back to us and pollute our bodies. LAUER: Yeah and you know we talk about things like global climate change and pollution and, and increasing acidity levels in the ocean. Just a couple of degree increase in the temperature of the waters here along this enormous barrier reef, the largest in the western hemisphere, can have a substantially negative impact on the coral, can't it? COUSTEAU: That's correct. Coral reefs are like little underwater cities. Over 70 percent of the oceans depend on what's happening in the coral reefs. The coral reefs die, the fish go away. Fish go away, we have no more food. And the, the cycle keeps going like that. LAUER: Not to mention, if these coral reefs here off the coast of Belize were to die, it would leave no barrier between the low-lying mainland and the ravages of the ocean. People, and this is happening all around the world, people in low-lying areas, if they're surrounded by reefs and those reefs die, they're in big trouble. LAUER: Alright. We're gonna get to talk much more throughout the next day and a half, Fabien. Thanks very much. It's a pleasure and honor to be here with you.